Hautala’s describing the Crosby-Ironton-Cuyuna region of northern Minnesota. What was once a booming industrial hub of iron-ore mines, logging, and a paper mill had transformed into a depressed community rife with abandoned storefronts, unemployment, and a sense of hopelessness. For decades, this region struggled with many of the issues that economically-downtrodden small towns struggle with. Fortunately, where many saw blight, others saw an opportunity. Surrounded by flatlands of central and western Minnesota, the Crosby-Ironton-Cuyuna region stands out. 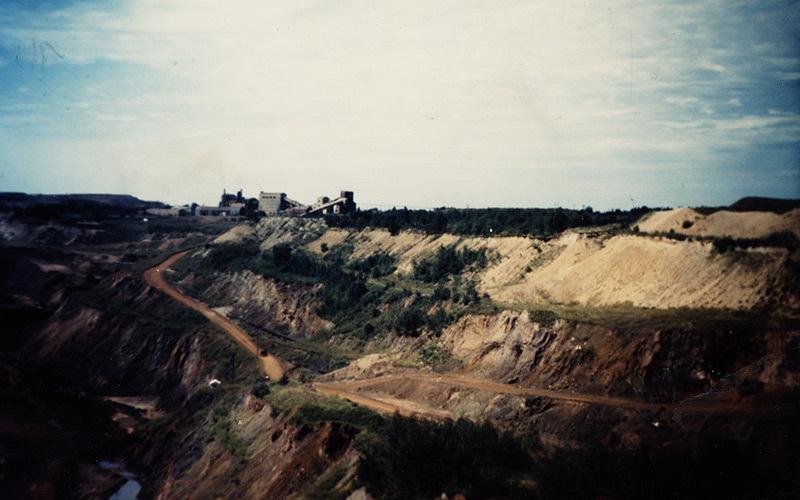 The history of mining had left rolling bluffs from waste rock and crystal clear lakes from former empty mine pits. The open, wooded area was a perfect singletrack destination — it just took the right people to see it. Before the first shovel could hit the red dirt that would one day be a section of singletrack known simply as “Cuyuna,” key players had to come together to ensure funding and support for the visionary Cuyuna Mountain Bike Trails project. One pivotal step towards the development of the trails was QBP’s hiring of Gary Sjoquist as the bike industry’s first full-time bike advocate in 1998. As a mountain biker who was heavily involved in the cycling community and with local government, Sjoquist was integral in bringing together the Department of Natural Resources, Minnesota Off Road Cycling, the International Mountain Bicycling Association, and politicians at every level of government to get the cogs of Cuyuna turning. Sjoquist worked with Oberstar over the course of several years to acquire funding and support for the project, getting $770,000 in federal funding and $125,000 in state funding by 2007. Thanks to additional heavy lifting from Minnesota legislators and mountain bike organizations such as IMBA, in 2009 the project received $1.2 million in state funding from the state legislature. Once he had federal and state politicians, along with various cycling organizations, supporting his vision, Sjoquist shifted his focus to the community that would become host to miles of trails and to the people who ride them. “This project could be a game changer for the region. We had a chance to not only built a mountain bike trail, but to create a new culture which has economic benefits to it,” Sjoquist explains. 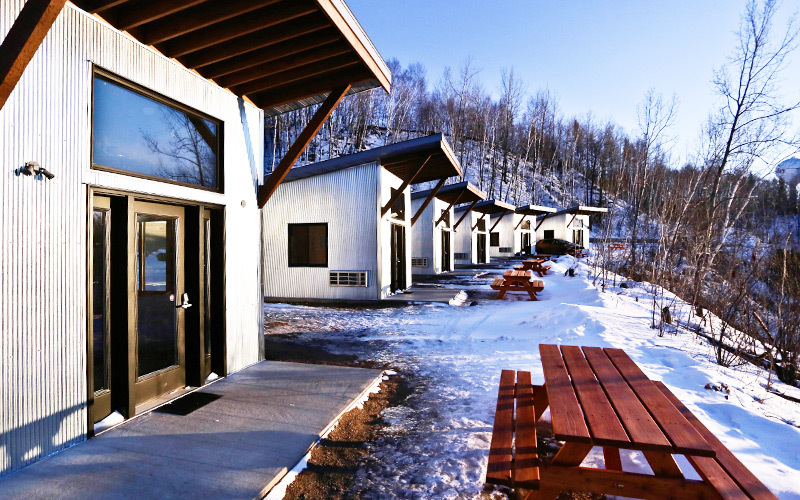 Knowing that a welcoming, thriving community that embraces the tourism industry was just as crucial to the success of his vision as the funding, Sjoquist set out to garner the support of Cuyuna-area business owners. “At first, the business owners had no idea what mountain biking was whatsoever. I realized I needed to bring these people over to Chequamegon in Wisconsin because I knew they were a thriving community in part due to the steady mountain bike traffic. So, I rented a 15-passenger van, and drove 2.5 hours to bring Cuyuna folks to have an in-depth discussion with people who had already done this. It ended up being a peer-to-peer discussion, which is a pretty powerful tool. By the time we got back, everyone was definitely pumped up about the project,” says Sjoquist. One business owner who didn’t need a lot of convincing was Jenny Smith, of Cycle Path and Paddle in Crosby. As a bike shop owner in an already depressed region during a nationwide economic recession, the news of mountain bike trails in her area signaled a potential change in business and signified a bigger change within her community. “I opened up in 2005 and by 2009, one year after the recession hit, I was thinking about closing down the store. It was a real struggle, but in 2007 I started working with the DNR in looking at the possibility of putting in some mountain bike trails. By 2009 I knew they were going to start construction on the trails the following year so I decided to stay open and see what would happen,” says Smith. With community support and initial funding secured, it was finally time to get down to the dirty details of trail work. Sjoquist’s vision required experienced trail builders. “I knew we needed to get someone who really knew how to build singletrack trails instead of a landscape architect who only knows how to build paved trails. The people who we brought in are two of the best mountain bike trail builders in the United States,” he says. In 2011, after countless hours of work with bike organizations, the DNR, politicians, the community, and, eventually, trail building crews, 25 miles of singletrack bliss were officially open in Cuyuna. The first year the Cuyuna trails were open, there were almost 20,000 visitors there for cycling specifically. Little by little, locals began to check out the trails too. 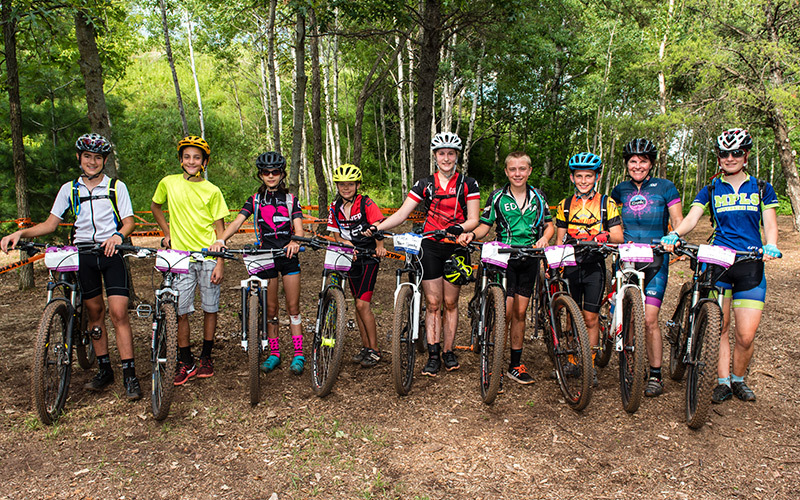 As local kids started mountain biking on their new trails, two NICA high school mountain bike teams were formed to channel their passion for the activity into an organized sport. In 2016, out of the 39 total Minnesota teams, Cuyuna placed 2nd in the DII results while Crosby-Ironton placed 3rd among the DII results. To say that the trails had an immediate impact on the community is an understatement. “The trails brought hope back to the area. It used to be a place that kids wanted to leave. Nobody wanted to stay around because there was nothing to do. People have hope now. They want to invest in the town. They want to live here. They have a future and they didn’t have that before. It goes beyond selling bikes and having cool places to ride,” says Sjoquist. For Jenny Smith, the immediate influx of cyclists to her community made a huge difference in the success of her bike shop and how she and others ran their businesses. 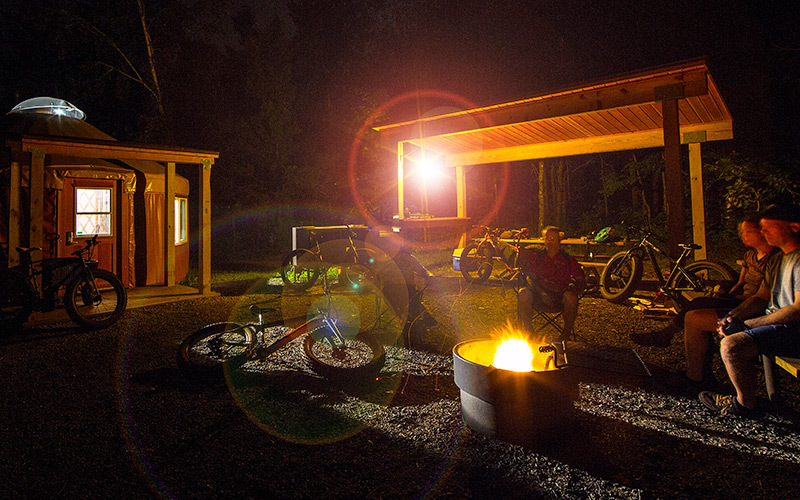 What was once just a shadow of a town had transformed into a major mountain biking hub. An incredible amount of progress had been achieved, but, the work wasn’t over yet. 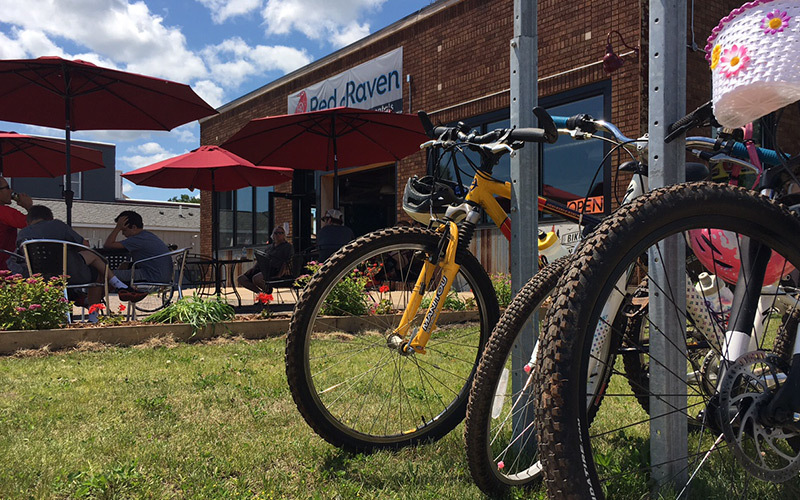 The Red Raven in Crosby will take care of your bike maintenance needs and fuel you up the ride. 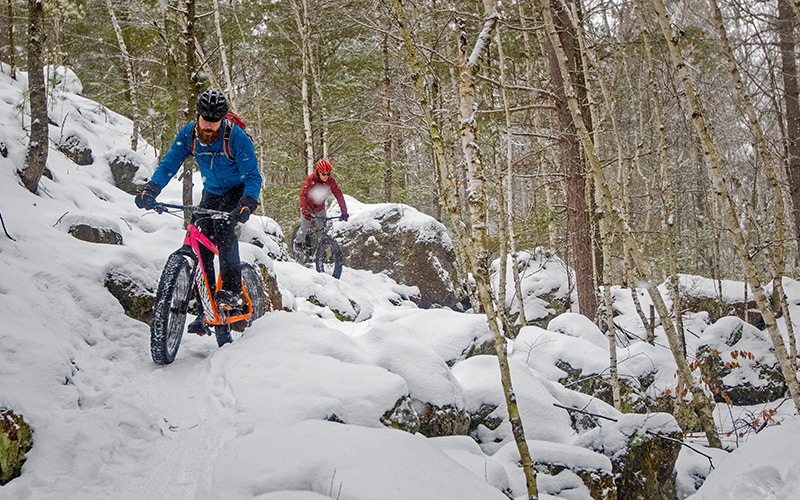 QBP brands like 45NRTH, Salsa, and Surly helped to introduce the region to fat biking. While not part of the initial plan, winter fat biking at Cuyuna is a now a big draw for the region. Enter Aaron Hautala. Born on the Iron Range of Minnesota, Hautala was familiar with the economic story of the Crosby-Ironton-Cuyuna region. After moving to the area, experiencing the Cuyuna trails for himself and recognizing all the possibilities they held, he knew he needed to get involved. With this mindset, Hautala got to work creating partnerships, working with the government, maintaining trails, and furthering his vision of what Cuyuna could be. Within six years, there were 14 new businesses in the region, cycling events had attracted more people to the area than there are residents who live there, and Cuyuna was well on its way to becoming a world-renowned mountain bike destination. 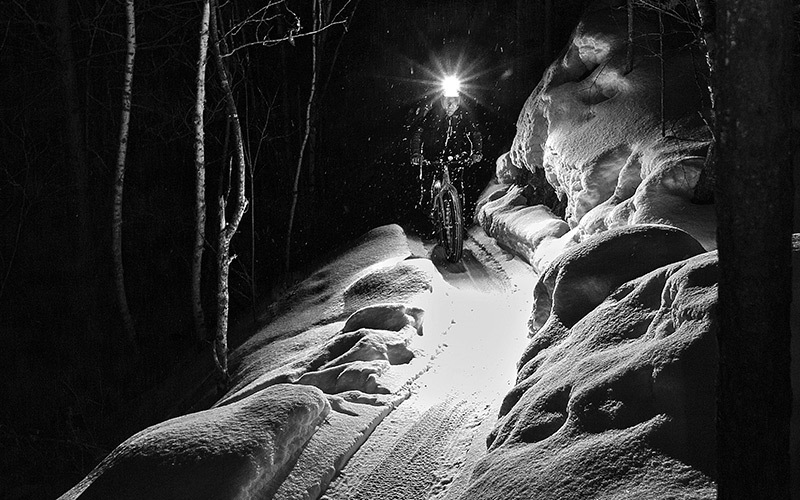 A partnership between Cuyuna and QBP brands was the perfect opportunity to further the destination’s popularity – even in the “off-season.” Events like 45NRTH’s Winter Whiteout and the annual Surly Red Dirt Fest became signature annual events that cyclists from all over looked forward to. “I never would have considered the winter side of cycling or realized how big and powerful we could make the draw of winter cycling without 45NRTH,” says Hautala. 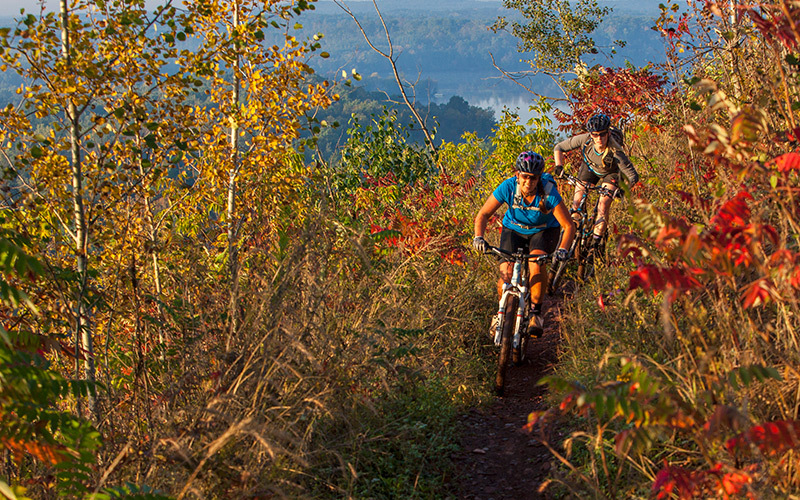 In 2011 IMBA ranked Cuyuna as a bronze-level mountain biking destination (it’s now ranked one step higher, a silver-level), garnering worldwide recognition. As word of the trails got out, increasing numbers of riders made the trip to see for themselves what all the buzz was about. This growth eventually led to even more plans to expand the trails. 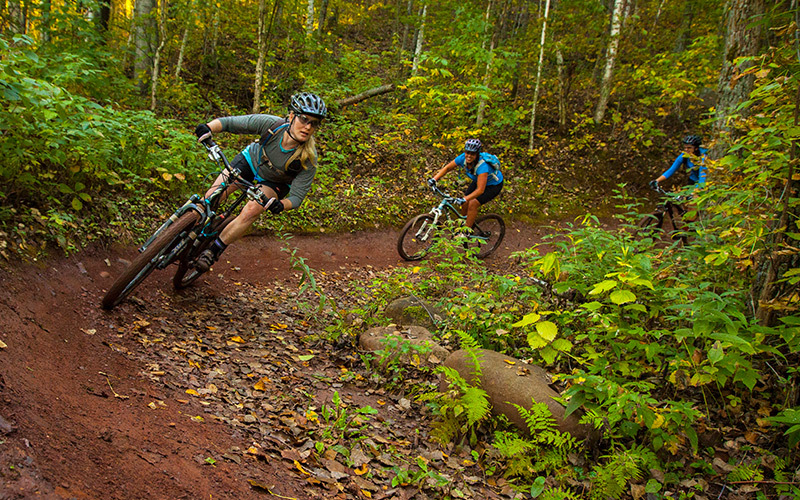 Being that the current Cuyuna mountain bike trail network is only about 10% of the available land, there is still plenty of room for the region’s recreational options to grow. A recent economic impact survey measured the effect that the proposed trail expansion would have on the region and landed on a conservative estimate of $21 million. While mountain biking has been a huge draw, the region is also blessed with deep, clear blue lakes, and long gravel roads, waiting to be explored. “My first goal is to finish the master vision, which is 75 miles of one-way mountain bike trails. Next, we’re working on 40, 70, and 100-mile gravel routes that start and finish at the brew pub. Then our focus will be water sports. The kayak and paddle experience is pretty remarkable here,” says Hautala.